Hi y’all! I’m finally back from my epic (I kid you not) trip to Iran! Well, actually, I’ve been back for a good few weeks by now but (thanks to a sluggish combination of jetlag, a bout of being blue about leaving Iran, and writer’s block) it has taken me awhile to slide into the old blogging groove. The writer’s block is certainly not due to a dearth of interesting things to report and share with you – the reverse in fact – I have so many stories, pix and videos to share. Instead, this has been more of a challenge of mustering motivation and focus. Kind of like standing in front of a fully stocked fridge and pantry — bursting with all sorts of delicious and exotic ingredients — and wondering: “But what should I make? What shall I make?” And in the frustrating process of indecisive, perfectionist (and I admit, lethargic) hand-wringing, ending up going hungry and involuntarily fasting! But I do intend to snap out of this and tell you all about my glorious and controversial homeland of Iran – a most paradoxical country – and share tales of what was an intense and significant personal milestone of a trip. I experienced deep highs and crushing lows; climbed many hills and mountains (literally! ); traveled to a number of cities; reconnected with friends and family and foe; enjoyed generous Persian hospitality, renewed relationships, fostered friendships, forged bonds, severed ties; basked in the innate poetic beauty of Iran and its culture, and cringed at the things that one must bear; saw and experienced things that made me glad, wistful, ecstatic, dreamy, nervous, enthralled, angry, happy, ashamed, proud, mad, deeply nostalgic, oft enchanted and sometimes profoundly sad; and of course enjoyed enviably good and yummy food that had me drooling and smacking my lips! Oh, the delicious things I ate and drank! I do hope to do this trip justice and recount and share it all with you in a meaningful and hopefully thoughtful way – including a few choice recipes – via a series of posts in the coming weeks and months, but I admit that I’m not yet entirely in the groove of being up to that task just yet. 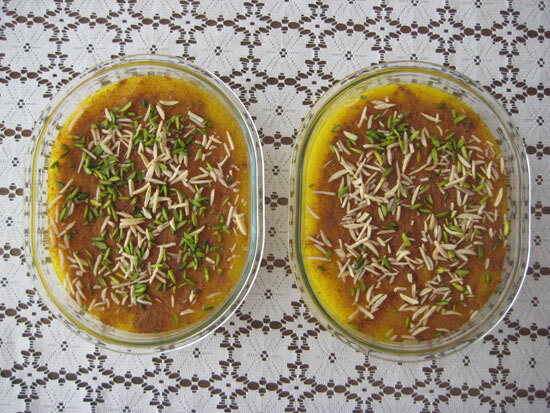 Sholeh Zard – A persian dessert made with rice, saffron & rosewater | Made by Afooli! These two yummy batches of Sholeh Zard (a traditional Iranian dessert made with rice, saffron and rosewater) were made by my friend Afooli for her Norooz party. Another time, my friend Haleh also specifically made it for me as well, so that I could photograph and document the recipe. I will post the recipe very soon. Promise! 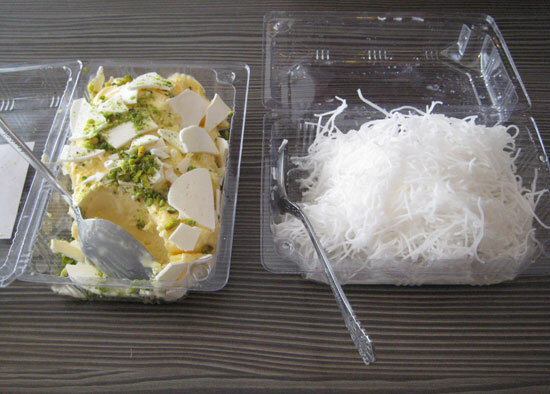 Jello desserts were quite popular in my childhood and I was surprised to see that they are still going strong in Iran. Usually served along with either ice cream or fruit. Koloocheh fresh off the oven! YUM! 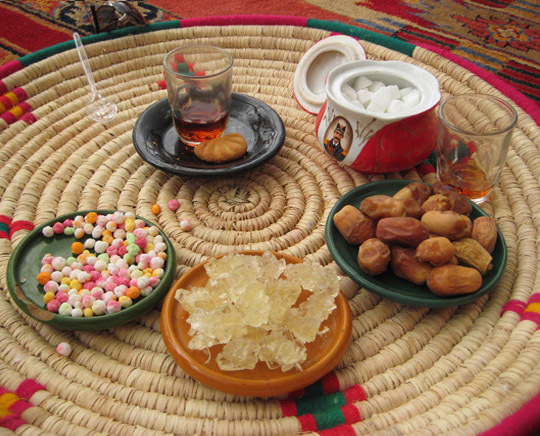 Ah, my sweet Koloocheh! Let me count the ways I love thee! 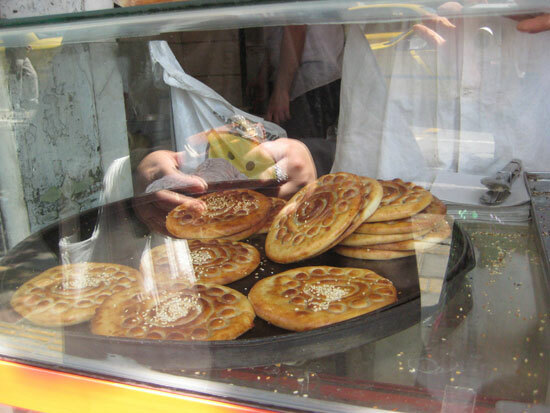 To avoid the too common travail of jumping up a few sizes after a trip to Iran, I tried to cautiously indulge and mostly succeeded in this endeavor, but tried as I might, I could NOT resist inhaling stacks of freshly made hot-out-of-the-oven koloocheh (a most wonderful and soft Persian pastry that is pillowy soft with a sweet center) whenever I got my greedy paws on some. And: je ne regrette rien! In fact, I only regret that I did not eat more of them! Mental note: Make some using Maria’s awesome kooloocheh recipe ASAP. 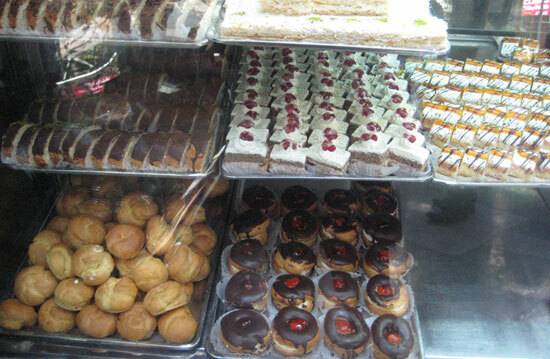 Oh sweet merciful cream and puff pastries! Needless to say: I miss these guys too! A lot! 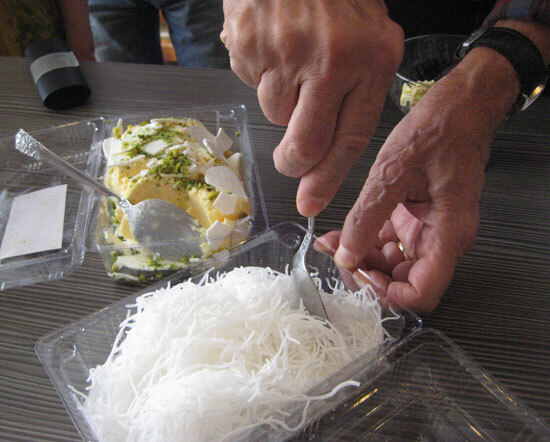 And I still get goosebumps at the memory of my first taste of faloodeh va bastani – a dessert composed of starchy noodle threads combined with traditional Persian (usually called Akbar Mashdi) ice cream (that has chunks of solid crunchy cream! say what!) 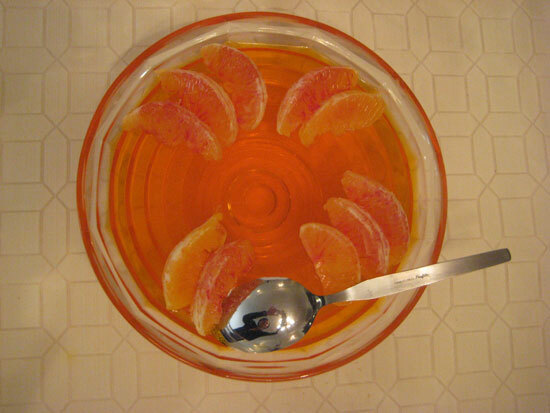 and served with a topping of freshly squeezed lemon juice – that my friends Afooli joon and Hossein served at their Norooz party. The combo of textures (soft, mildly chewy and starchy, crunchy) and flavors (sweet, pleasently bland, tangy) was an intoxicating close-your-eyes and savor your life pleasure! Perfection! In conclusion: boy, did I miss y’all and I’m happy to be back, and please bear with me while I catch up and get back into the groove. Before signing off, I have to give a huge howdy and thank you to all of you who kept in touch and kept reading and commenting and to all of you wonderful friends who wrote the guest posts that helped me keep this blog humming along even while I was frolicking and traipsing around in my homeland. Thank you! Drool worthy! It must be hard to get back into the groove after such a momentous journey. Glad you are back…..
Mmmmm…. want it all especially that ice cream with the noodles. Can’t wait to hear about your trip! Welcome back here , Azita, seems like you had a bash of everything back home. It must be like a culture shock for you, coming back here, at least that happens to me each time I go back to Germany, and I go quite often. Thank you dear Cornelia! It’s good to be back but I’m entirely homesick already. I hear you re the culture shock! 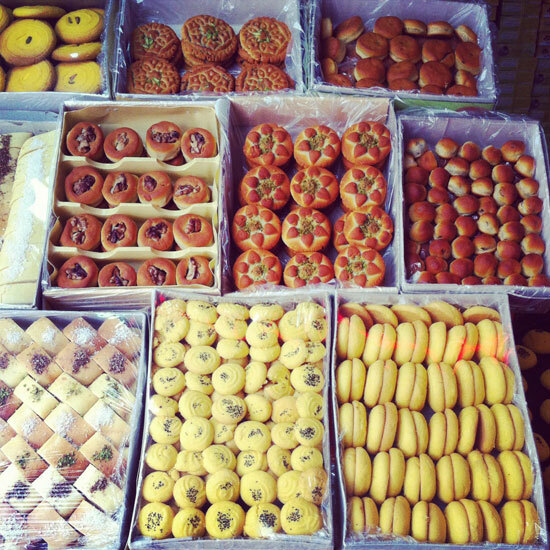 Oh those Persian desserts, how exquisite! Yum, yum! The photos are wonderful! Thank you for sharing them!. I lived in Shiraz almost 40 years ago. 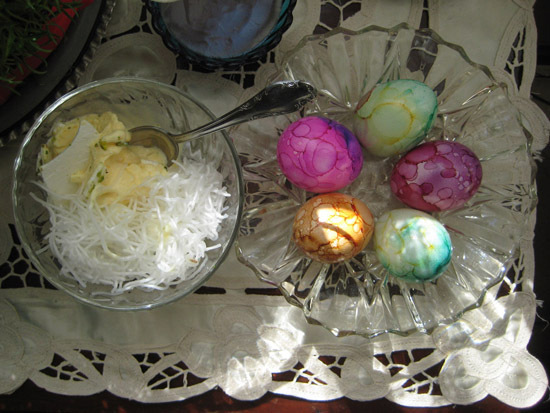 My favorite desert was frozen faloodeh (I think I remember adding “ye” at the end – would that be correct?) with rose water and lemon juice which I ate in the bazaar!! Thank you for reading and commenting and if you ever feel like sharing some of your memories, stories or pix from your time in Iran/Shiraz, I’d LOVE to have and post them. You’ve left me breathless and drooling for more, Azita! 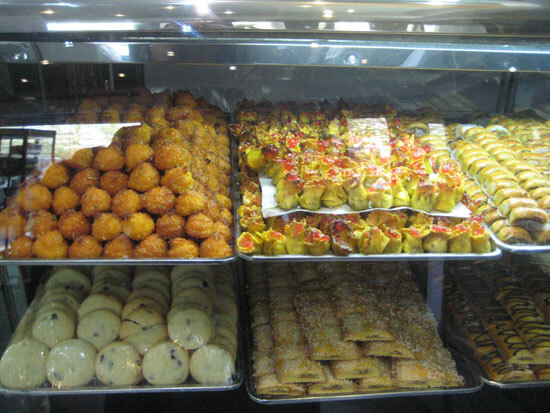 It is torturous to go through all these beautiful and delicious looking morsels you have for us as ارمغان. As I’m drooling all over them, I’ll be holding my breath & waiting to read more & more all about what you have to share with us ( تلخ و شيرين) hopefully mostly sheereen(sweet). Have a restful evening. Ooh, the word “armaghan” put me firmly back in Isfahan. Was walking with my aunt and joking about this and that and this word came up. Welcome back. What amazing food you ate. So glad you were so moved. Welcome back, Azita! Glad you had a great time! Thank you! 🙂 Was thinking of you the other day when debating if I should finally take the plunge and start watching Doctor Who! How lovely to have you back Azita! Sounds like an amazing trip… can’t wait to hear more about it! 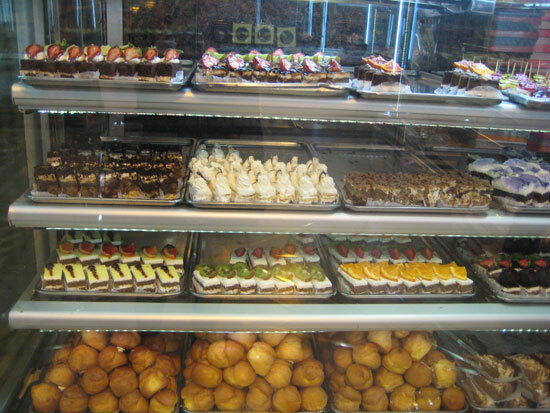 These photos are definitely drool-worthy – very envious that you got to sample all of this deliciousness! Dear Margot, it’s lovely to hear from you! Thank you again for your gorgeous guest post. I feel the same way, overwhelmed with things to write about so that I am confused at the end. lol as you said it, I blame perfection and a lack of focus too. Anyhow, I am excited to read about your trip to Iran since it’ s quite a mysterious country to me. So much history but so little ever reaches to us that I have no clue what the culture might be like. 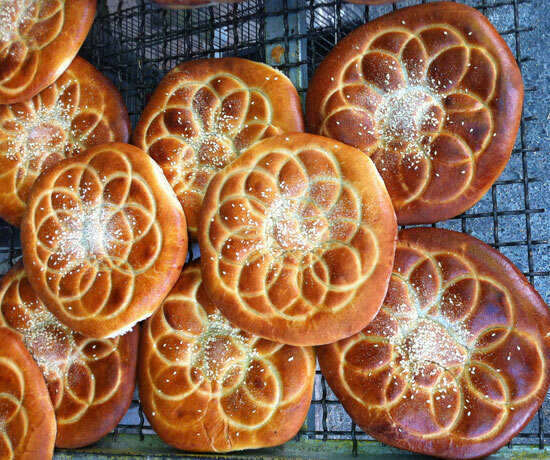 I fell in love with the koloocheh and I am going to check out the recipe now! What a treat to hear from you and I’m thrilled you’re interested in knowing more about Iran as I do hope to shed some light on it and present it in as fair and true manner as possible. I wish, wish, wish that I could have gifted everyone with a taste of hot kooloocheh, but that not being possible, Maria’s recipe is an excellent substitute. Do let us (me + Maria) know how it turns out. Dearest Laura! I am so glad to be back. 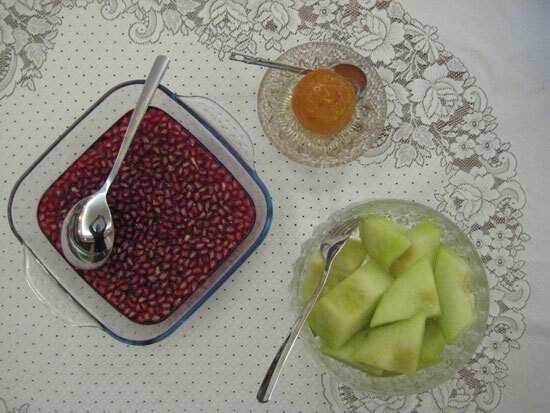 I thought I knew something about Iranian cooking as well but I also was quite surprised by a number of (uniformly delightful) culinary discoveries. Hope to share them all. Thank you for such a sweet and warm welcome! I truly enjoyed following your trip through Instagram. Such visually rich photos saturated with colors and textures…and of course flavors. Welcome back! Welcome back, my dear friend! I’ve been away from the computer for a while, and am just now slowly catching up… What a lovely post! I totally get the mixed feelings, and the need to let things settle down a bit before being able to find what needs/wants to be expressed as well as the words to do so. Welcome back, Azita! I’m looking forward to catching up on your recent posts, and to find out more about what you chose to share, and where you’re at right now too. Cheers!